Yes, a week on what if anything requires attention in this sphere. New President Mandel would appreciate valid insights. 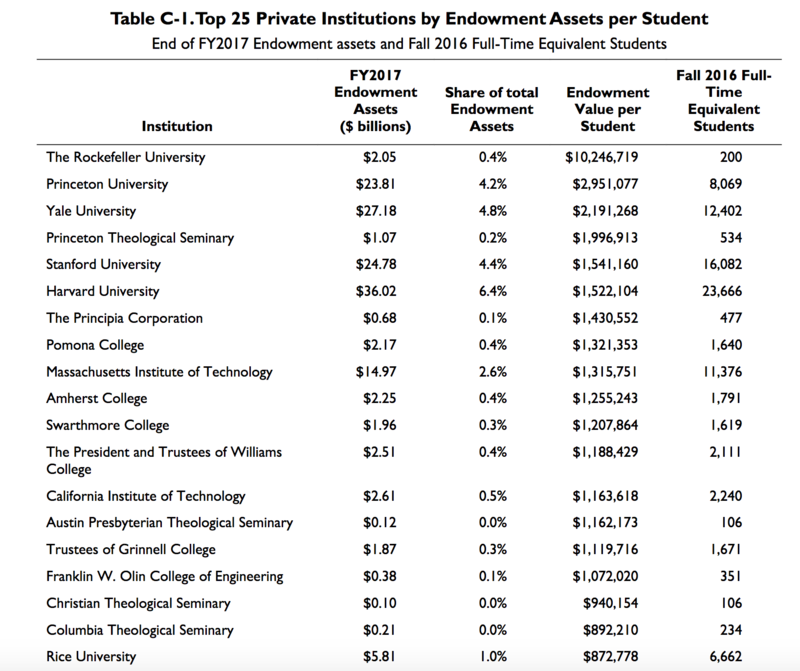 From memory, I think Williams has been ahead of Amherst/Swarthmore/Pomona in total endowment but marginally behind in endowment per student over the past 15 years or so. Given the number of fixed costs of running a school, both numbers are important—it doesn’t cost Williams $1million to educate its 2,000 or 2,001st student. What does “share of endowment assets” in this table reflect? Sure Rockefeller U has 10.2 mil per student … top o’ the list. But do they have a football team, a marching band, a fight song, an alma mater? Where is that 10.2 going! Let’s measure them by ‘school spirit’ indicators and see where they come out! I believe that’s the share of all endowment dollars of every higher educational institution in the US. The authors are making the point that assets are quite concentrated to support taxation of the assets. The Dartblog post makes the point that, despite drawing substantially more down from the endowment per student than Cornell and Brown, Dartmouth might not be getting much more, due, presumably, to poor management. That strikes me as being an interesting question: how does Williams compare to its peers (schools like Amherst/Swarthmore/Pomona, not Cornell or Brown) in this respect? To some extent, it’s difficult to make this comparison — presumably, a dollar in Williamstown goes further than a dollar in Pomona, due to differences in the cost of doing business — but I wonder if there are nevertheless interesting differences. 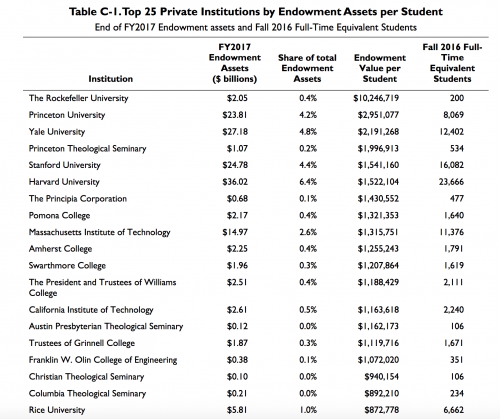 (And, to the extent that it’s possible to get access to this level of granular data, even if Williams and Amherst/Swarthmore/Pomona draw down their endowments similarly on a per-student basis, do they allocate those resources similarly? And even if the amounts allocated are similar, are the similar even when adjusted for COL and similar differences?) There’s a lot to unpack here. Incidentally, although Brown and Cornell are poor comparisons to Williams from an institutional management perspective, there are some respects in that these schools are peers. For example, when evaluating differences in faculty salary, we should absolutely be including more than just the top 10 or so LACs — many prospective faculty members (most? all?) will be applying to and considering a broader array of options than just Williams/Amherst/Swarthmore/Pomona. I know someone, for example, who ultimately was deciding between a tenure-track offer from Williams/Amherst/Swarthmore/Pomona and a tenure-track offer from a respectable state flagship professional school (and salary and teaching load played a substantial role in this person’s ultimate decision). I suspect this is more the exception than the rule, but my bet is that most candidates to whom Williams makes a tenure track offer will also be considering offers from a more diverse array of institutions than one or more of the top 10 LACs. Not one in 25 of prospective members of Williams 2022 gives any thought to any of these figures. EphBlog is powered by WordPress and delivered to you in 0.768 seconds using 41 queries..